Israeli soldiers and navy abducted, Monday, at least thirty-six Palestinians, including eleven fishermen, in several parts of the occupied West Bank, including East Jerusalem, and in Gaza waters, in Rafah, in the southern part of the besieged coastal region. 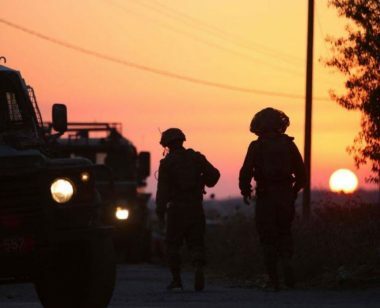 In Qalqilia, in northern West Bank, the soldiers invaded many homes at dawn, and violently searched them, before abducting seven Palestinians, identified as Wissam Ezzeddin Silmi, Luay Freij, Qassem Swayy, Hamza Walweel, Mohammad Ibrahim ‘Oweiss, Saher Farraj and Ali Mohammad Hannoun. In Tulkarem, also in northern West Bank, the soldiers invaded homes in Anabta town, east of the city, and abducted Hisham Husam Fuqaha and Dia Ala Fuqaha. In Hebron, in the southern part of the West Bank, the soldiers abducted six Palestinians, during extensive and violent searches of homes, and illegally confiscated cash. In Halhoul, north of Hebron, the soldiers abducted Mohammad Younis al-Baw, 22, in addition to Anwar Mohammad al-Baw, 20, and his brother Laith, 19. The soldiers also abducted ‘Atef Rabba from his home in the ath-Thaheriyya town, southwest of Hebron. Mohammad Awad, a senior nonviolent activist in Beit Ummar town, north of Hebron, said many army vehicles invaded several areas in the town, searched and ransacked many homes and abducted a former political prisoner, identified as Saddam Ali Awad, 28, in addition to Taiseer Khaled Breigheeth, 23, who was taken prisoner from a local bakery, in the center of the town, and moved them to Etzion military base and security center. The soldiers also invaded the home of a former political prisoner, identified as Suleiman al-Qawasma, in addition Hamza Syouri, the principal of a local school, and violently searched them before confiscating large sums of cash. Syouri said the soldiers even smashed his children’s money boxes and stole their savings. Furthermore, the soldiers invaded many neighborhoods in Hebron city, in addition to the towns of as-Sammoa’ and Yatta and installed many roadblocks at the main entrances of Sa’ir, Halhoul, and northern Hebron, before stopping and searching dozens of cars, and interrogated many Palestinians, while inspecting their ID cards. In Bethlehem, the soldiers invaded Teqoua’ town, southeast of the city, and summoned Ahmad Mousa Jibreel, 36, for interrogation in Etzion military base, north of Bethlehem, after searching his home. Furthermore, Israeli navy ships attacked with live fire many Palestinian fishing boats near the shore of Rafah, in the southern part of the besieged Gaza Strip, abducted eleven fishermen and confiscated three boats. Mohammad ‘Adel Miqdad, Ibrahim ‘Adel Miqdad, ‘Ala Ibrahim Miqdad, Mohammad No’man Miqdad, Mohammad Ibrahim Miqdad, Adel Ibrahim Miqdad, Ahmad Shaker Miqdad, Ahmad Ziad Bardaweel, Mohammad Farahat ‘Ashour, Amin Sa’adi Jom’a, Ahmad Ziad Bardaweel and Ahmad Mohammad Tababsha. On Monday at dawn, the soldiers abducted ten Palestinians during massive and violent searches of homes, in many parts of occupied Jerusalem, and moved them to several detention and interrogation facilities. In Silwan town, in the center of Jerusalem, the soldiers abducted Ayyoub Abu ‘Assab, Hafeth Dirbas, Mohammad Nimir Dirbas, Ayyoub al-Hindi, Saleh Na’im Moheisin and Mahmoud Gharib. Furthermore, the soldiers invaded homes in Shu’fat refugee camp in Jerusalem, and abducted Adnan Aramin, Mohammad Zeidan and Tareq Kayyala, in addition to Amin Fathi Hamdan, who was taken prisoner from his home in ‘Anata nearby town.